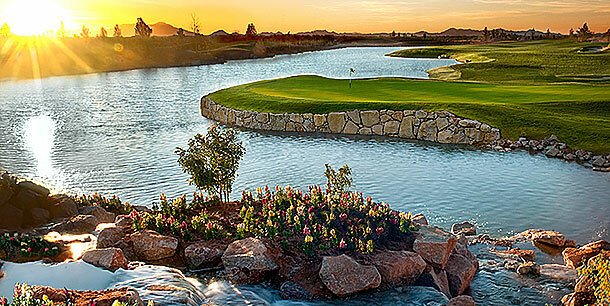 The golf buzz in Tucson these days is all about the city’s latest, greatest golf course, Sewailo, the first true champion- ship layout to be built in Arizona in the past five years. Adding to the excitement: former PGA Tour player/ Golf Channel analyst/architect Notah Begay has his name on it. Sewailo, pronounced “Say-why-lo,” is an enterprise of the Pascua Yaqui Tribe, which also owns Casino Del Sol. The casino is in the southwestern corner of Tucson off Valencia Road, and the 7,500-yard golf course, which is managed by Scottsdale-based Troon, is directly south of the casino. Begay and his NB3 Consulting Company served as the driving force for Sewailo, with help from fellow architect Ty Butler and the tribe. So what does Begay, a budding star in both the architectural and broadcasting industries, think of his third course, which follows Sequoyah National in Cherokee, N.C., and Firekeeper Golf Club in Topeka, Kan.? “It’s vastly different from anything I’ve done yet, chiefly because we had to move a lot of dirt to create the type of big-theater feel we were after,” said Begay, a three-time All-American at Stanford and a four-time winner on the PGA Tour. Landscapes Unlimited, which works with Begay on all of his projects that are done exclusively with Native American tribes, had the task of moving 30,000 shrubs and trees, as well as hundreds of saguaros and other indigenous plants. According to Begay, the planting and replanting were quite successful on the 100-acre property that includes 14 acres of lakes and 1 mile of creeks. Additionally, there was a massive amount of rockwork done throughout Sewailo, including bridges and green settings. “Sewailo has three distinct feels or segments to the golf course,” said Begay, 40, who has an economics degree from Stanford and once shot 59 in a Tour event, the third player in history to do so. The Yaquis migrated from Mexico to Arizona way back in 552 AD, where they lived between the Yaqui and Gila rivers. The history of the tribe can be found at www.pascuayaqui-nsn.gov. Sewailo is the Yaquis’ biggest enterprise following the casino, which today employs more than 700 members. The course also could add as many as 75 jobs to the payroll. “This is a golf town with lots of great golf properties, and we’re the new guy in town. Plus, we’re managed by Troon. “It seems that everybody is talking about us, and that’s probably the reason we’ve already booked so many tournaments. The 18th hole is the perfect example, as the fairway and near- island green bring water into play. It is a dramatic conclusion that crescendos at the finish, although LaRouere wasn’t quite ready to concede that the 18th is Sewailo’s signature hole. One thing is already dead-solid perfect about Sewailo, LaRouere added. And it’s all about the guy who worked for four years with the tribe to conceptualize the idea. “Notah Begay is a rock star to Native Americans, not just with the Yaquis,” he said. Begay, who is one-half Navajo and one- quarter San Felipe and Isleta, understands his role for the tribes he builds golf courses for to a “T.” He also gets golf, which makes for a terrific one-two punch. “The vast majority of the tribe has never played golf, doesn’t really know the game, and so my role is to help them form their ideas,” said Begay, who has several other projects with Native American tribes in various stages. How good is Sewailo, according to the guy who dreamed it up? “I think we hit a home run, although we still have to see how the people take to it,” Begay said with cautious optimism. “I think the water holes are exceptional, and we were very creative in that we brought in lakes to fill in all the dirt we moved to make mounding and bunkers. And we moved a lot.